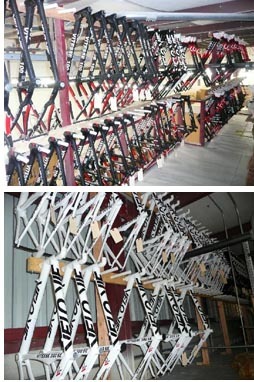 The worldwide demand for Velo Vie's precision bicycles has resulted in the expansion into a substantial warehouse. The facility located in Tempe, Arizona supports the rapid growth of Velo Vie by offering enough space to effectively organize inventory while still allowing for ample room for the executive team to meet. Homayoon Farsi, CEO states, "The warehouse facility gives us the space we need today while allowing for more expansion in the future". One of the principle reasons the move to the warehouse was needed was due to the ever-increasing demand for Velo Vie bicycles for teams and clubs. In the new location, a higher degree of quality assurance is invested in each bike that leaves the warehouse. Processing the worldwide orders is more efficient and accurate. In addition to this, Velo Vie has partnered with FedEx and International Shipping for on time deliveries worldwide . "We are confident that the customer will reap the benefits of these improvements right away", echoed Mr. Farsi. Velo Vie is an Arizona-based company that manufactures and sells high performance and racing bicycles direct online. Founded in 2006, Velo Vie offers highly customizable bicycle frames featuring Velo Vie" Carbon Axis technology. Velo Vie offers consumers top quality components through its relationships with manufacturers such as Shimano, Campagnolo, SRAM, Zipp, Fulcrum, Reynolds, Easton, Vision, Profile, Ritchey, FSA, Deda, Rolf, Time, Speedplay and Look. For more information about Velo Vie visit www.velovie.com. Contact info press@velovie.com or call 1-877-VELOVIE.